I am SO very excited to share this birth story with you! 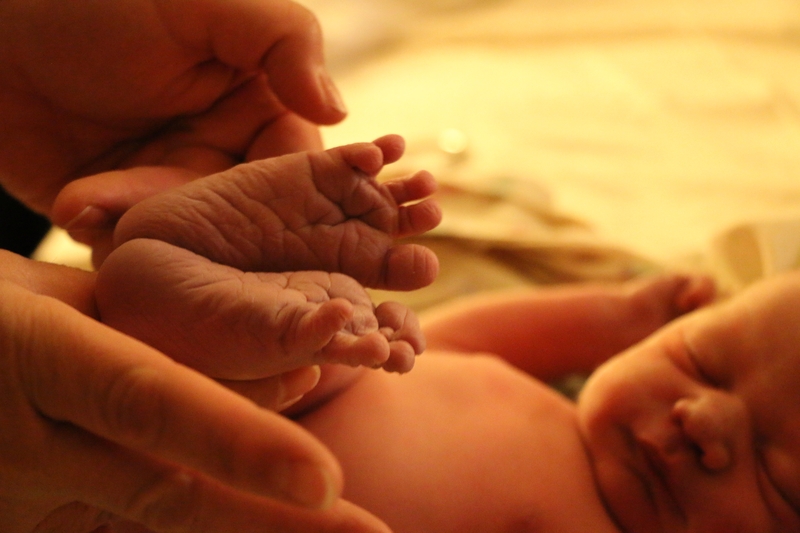 It was such a privilege to be at this birth as a doula. I was so impressed with Cyndi and her ability to stay calm and relaxed through a 23 hour labor! Enjoy! At the end of May during a checkup with my nurse midwives, Scott and I were told I was dilated to 4 centimeters. That was quite surprising for us, because I hadn’t felt any contractions up to that point. Plus, it was two weeks before our baby’s due date, and we were both expecting her to be overdue. Our midwife suggested that we go out on a date to enjoy our time together as a couple, have a good meal, walk around the mall and see what we could do to get that baby to come. Though it sounded like fun, we ignored her advice for about a week, but then Friday night, June 7th, Scott and I we decided we were ready to see if it would work. We went to dinner, then we took a walk around the Riverwoods Shopping Center. On the way home, we stopped and bought dessert. It was a wonderful night that we spent enjoying one another’s company. Around 3 AM the following morning, I woke up with cramps that came and went every ten minutes or so. I came out the living room to watch some TV and try and get some sleep. Around 6:30, I went back into the bedroom and woke Scott to tell him that I was having these cramps. I think it startled him out of his sleep a little bit more than I had intended, but we were both able to go back to sleep for a while. Later in the morning I got up, showered and put on some comfortable clothes. We didn’t do much else that day, other than watch TV and work through the cramps. Scott was very supportive- he even used an app on my phone to time the distance between (what I then realized were) contractions. They stayed about 7 to 10 minutes apart for most of the day. In the early afternoon, we contacted our doula, Fiona, and our parents to let them know what was going on. And, of course, we got several calls back from them throughout the day wanting to know how things were going. I took a bath around 2:30 or 3:00, then we watched some more TV. I alternated sitting on the couch and the exercise ball. Moving was quite difficult, because every time I would move, I would cause a contraction. Scott was so helpful. The only time he wasn’t right by my side was when he went to the store to get some provisions for the hospital. I tried to eat throughout the day, but I really wasn’t very hungry. We checked into the hospital around 5:45 PM. I was 6 or 7 centimeters dilated. They took us down to our room. Fiona, arrived shortly after. She set up some essential oils aroma therapy and we turned on my relaxation music and then, we waited. The contractions got progressively closer and closer together until they were about 2 or 3 minutes apart. My mom arrived during this time and so did Scott’s parents. For most of the time, however, they were out in the hallway. I didn’t know it at the time, but there was a computer out there showing my contractions and the baby’s heart rate. So, I guess our parents were pretty entertained :). Fiona and Scott were amazing. I spent most of the time sitting up in the bed, but got up to use the bathroom, stood for a few contractions supported by Scott, and tried sitting on the birthing ball. Interestingly, Fiona and Scott tried counter pressure (which had been working at home) but at this point in the labor, it just made things worse. But, we made it through anyway. My water didn’t break on its own. Around 10:30 PM, I was past 9 1/2 cm and it still wasn’t broken. For some reason in my mind I kept thinking that I didn’t want them to break my water. If it had been earlier in labor, that could have led to other interventions, but at 9 1/2 cm…it really didn’t make a difference. I was alone in the room with Fiona and I mentioned that maybe I should just let my midwife break my water. She said she thought that would be a good idea, so, the next time our midwife came into the room, I had her break my water- which didn’t hurt at all, thankfully. After that, we began the actual delivery phase of labor. I tried to relax and just breathe the baby down, but by that time I found that I really didn’t have the patience for it, so around 12:30 Sunday morning I asked my midwife, “What do I need to do to get this baby out?” She told me I needed to really push. So, that’s what I did during each contraction. I pushed as hard as I could for as long as I could, but it really didn’t seem to make a difference. I pushed like this for almost an hour with, what I felt, was little progress. The baby couldn’t get past my pubic bone, so every time I stopped pushing, her head would go back up. Of course, I have to say that the position they had me pushing in was incredibly awkward. I felt basically powerless in this position. I was semi reclined on my back, resting just above my tailbone. During each contraction, they had me pull my legs back toward my chest, and do sort of a crunch, curling my chin into my chest. On top of that, they said the baby’s heart rate was getting low, so they had me wear an oxygen mask as well. Being so tired and sweaty and worn out…this did not make for a good situation. I started crying between contractions, not because I was in pain, but because I was so frustrated by the fact that I wasn’t making any progress and I felt powerless. Around 1:30 AM, my midwife told me that she felt she needed to give me an episiotomy because there wasn’t enough room for the baby to come out and they were concerned about her heart rate, so they needed to get her out soon. That was something that I really didn’t want. Thankfully, Fiona knew that, and she suggested that we change positions and have me squat instead. Our midwife agreed to let us try this, so Fiona and Scott helped me reposition and supported me with one of my arms around each of their shoulders. As the next contraction came, I pushed just as hard as I had before, and just like that, she was born! It was amazing! We didn’t get to do delayed cord clamping because the baby wasn’t breathing immediately, but Scott still got to cut the cord. He was so excited and very emotional. I was so exhausted and on edge because I wasn’t sure the baby was okay. But, once we heard her cry, relief flooded over me. It was amazing how all of a sudden all the difficulties of the previous day just melted away and I knew that it was all worth it. We finally had our sweet little baby- the angel we had been waiting for for so long. And she was perfect: 7 pounds 15 ounces, 20 inches long with beautiful dark hair. Even her cry was beautiful. Scott was the first to hold her. He took her out into the hall to meet her grandparents. The staff was still busy with me: stitching me up, massaging my uterus. I ended up getting Pitocin because I was hemorrhaging slightly. That passed fairly quickly, though, and I really didn’t feel the Pitocin at all. It was probably 30 minutes before I finally held our little girl. She was so beautiful, wide awake and alert. I got to hold her and nurse her for a while before they took her to the nursery. I didn’t end up getting to sleep until around 4 AM. It was a very long day- but so worth it- one of the very best days of my life. The next morning, Scott and I walked down to the nursery to watch our baby get her first bath. She was just so adorable! Later that morning, we decided on her name: Elizabeth Ann Hampshire. We’ll call her Lili. We went home Monday morning, and since then we’ve been adjusting fairly well. Nursing is still a little bit of a struggle- mostly the struggle is just getting her to eat enough! She likes sleep more than eating 🙂 But, that is such a small trade off for how wonderful she is- we are both totally in love with her.